12″ discharge height, 45° discharge angle. 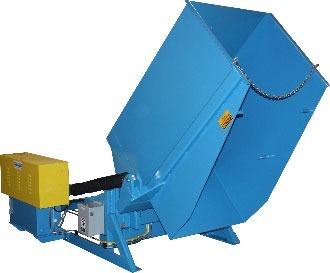 36” wide x 58” deep loading skip, floor level load. Hydraulic cylinders include a protective flexible bellows package for extended life. Carbon steel cleaned, then painted MTS Safety Blue using a two-part industrial epoxy system. Electricals wired to terminal strips in a Hoffman NEMA 4 enclosure. Pumping unit is driven by a Baldor 5 HP, 575v/3ph/60Hz motor. 5 GPM Parker hydraulic system with MTS exclusive two-speed hydraulic circuit.